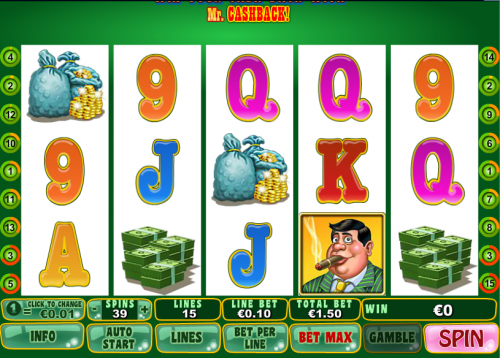 There’s no pretence about Mr. Cash Back from Playtech; it’s a big, bold online slot machine which revolves entirely around money, wonga, cash – whatever you want to call it. It looks good and it’s even got a bonus feature we’ve not seen before – read on to find out more! So it’s all about money and this slot is a five reel and fifteen payline game with Mr. Cash Back as the main character; Playtech’s standard playing cards are used for the lower value symbols but further up the scale all the symbols have one thing in common – cash. So we have a piggy bank, bags of gold coins, a pile of money and our hero himself. The cigar-chomping Cash Back is the wild symbol and the Cash Back logo is the scatter. This is the feature we’ve not seen before and it’s a good idea, especially if it feels like you’ve been playing for ages with no positive results; if any of your active paylines fail to produce a win in 50 spins, you’ll win back 50x your line bet. Additionally the status of a line is saved even if you leave the game and return to it. This is where we’ve found the big money and to trigger this bonus game you’ll need to land three or more scatter symbols anywhere on the reels. All wins are subject to a 2x multiplier and after each spin, at least one wild symbol will fly on to the reels and last for between one and four spins. It’s quite possible to end up with five or more wilds on the reels which means a decent payout. This is a good old red or black 50/50 bet and you can access it by clicking the ‘Gamble’ button following a win; just pick red or black to try and predict which card will be revealed and double your money – if you are wrong you’ll lose that win. We like this slot; it may not have state of the art graphics but the gameplay is excellent and the bonus features are appealing. The Cash Back feature always seems to reward you just when you’re getting fed up with not winning. Players can bet from a minimum of €0.01 on one payline all the way up to €750 with all lines active.